They are only licensing to big companies for now. But at least it shows where the tech is heading. "Move your head from side to side, forwards and backwards, and the camera is smart enough to reconstruct what the view looks like from different angles. Instead of just looking around the inside of a photosphere, you now have movement within it. This lets you explore 360-degree video freely, the same way you can in VR spaces. All of this is due to some special software that Facebook has created, along with the carefully designed pattern of the cameras." 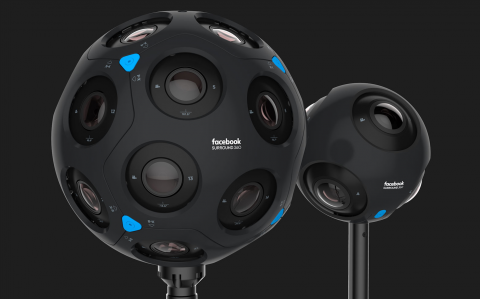 "But before we get into all that, let's talk a little bit about what sets these cameras apart from normal 360 ones. With a traditional fixed camera, you see the world through its fixed lens. So if you're viewing this content (also known as stereoscopic 360) in a VR headset and you decide to move around, the world stays still as you move, which is not what it would look like in the real world. This makes the experience pretty uncomfortable and takes you out of the scene. It becomes less immersive." "With content that's shot with six degrees of freedom, however, this is no longer an issue. You can move your head to a position where the camera never was and still view the world as if you were actually there. Move your head from side to side, forward and backward, and the camera is smart enough to reconstruct what the view looks like from different angles. Instead of just looking around the inside of a photosphere, you now have movement within it. This lets you explore 360-degree video freely, the same way you can in VR spaces. All of this is due to some special software that Facebook has created, along with the carefully designed pattern of the cameras. According to Brian Cabral, Facebook's engineering director, it's an "optimal pattern" to get as much information as possible."